Earn 3450 loyalty points when you order this item. 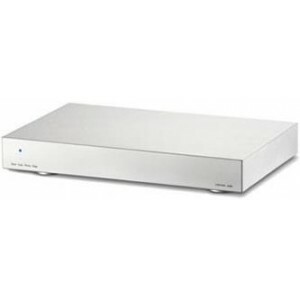 The Silver Cube is a reference phono stage, pushing the boundaries of an analog front end - in a very short time it has become one of the very finest phono stages on the market. Lehmann's efforts in terms of technology, high end electronic parts and mechanics have lead to transparent, high-energy sound reproduction with holographic soundstage delivery. Visually the massive milled aluminium case of the audio section impresses, while acting as a heatsink for the discrete zero-feedback Class-A FET output stage. The Silver Cube not only provides maximum air and space with excellent soundstage depth and width but also stunningly fast attack response, pace, timing, swing and dynamics, you will not be left untouched. Listen, and you will understand.